...are the names of our next release that developers can look forward to (it is great to finally be able to talk about some of the new features publically... even though I have already hinted at a couple e.g. here ;-). Soma made the announcement; his blog post focuses on the VSTS SKU. The theme continues on channel9 all week. 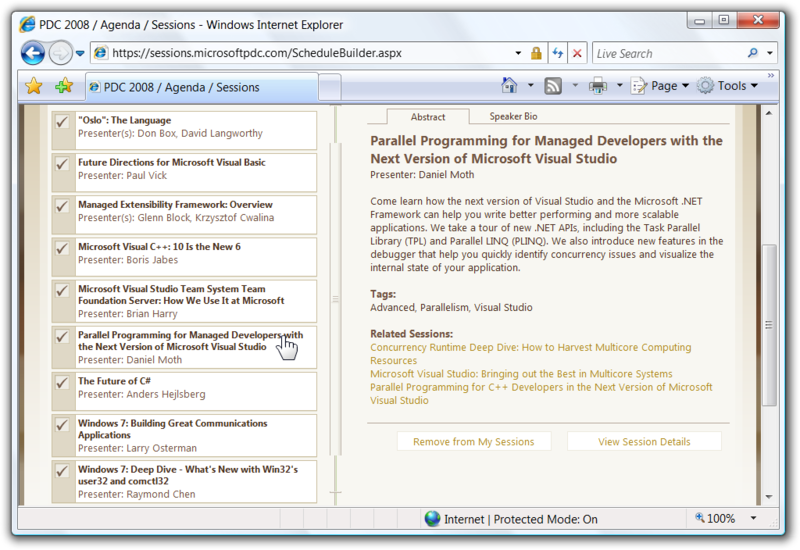 Also just noticed the presspass announcement and MSDN page. 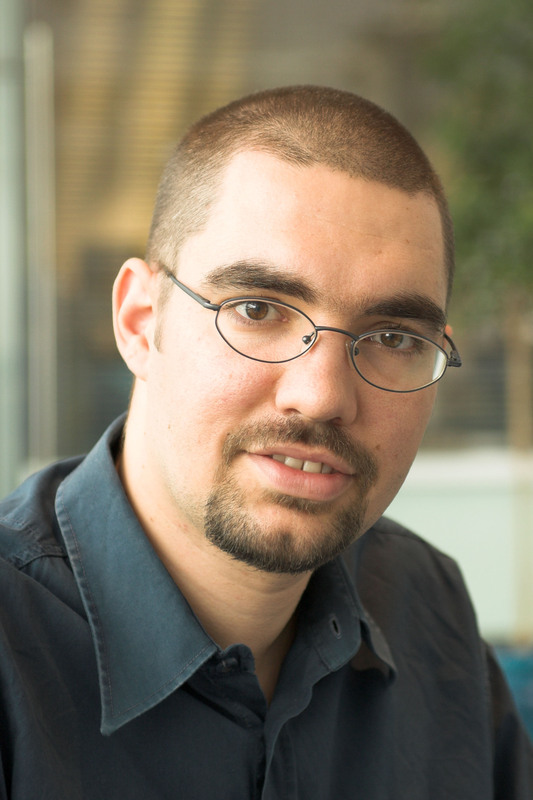 "We have to master the transition to a parallel programming environment, with highly distributed, concurrent systems." The current thread (aka active thread in some circles) is the thread that is currently selected in the Threads window, indicated by the yellow arrow icon (in the screenshot above, the "Main Thread"). By default the current thread is the one that hit the breakpoint (or, for example, the one on which the exception was thrown) which resulted in breaking in the debugger (all threads). You can switch the current thread via the ContextMenu on the Threads window (or by double clicking on a thread in the listview). When changing the current thread, the Call Stack window updates itself. 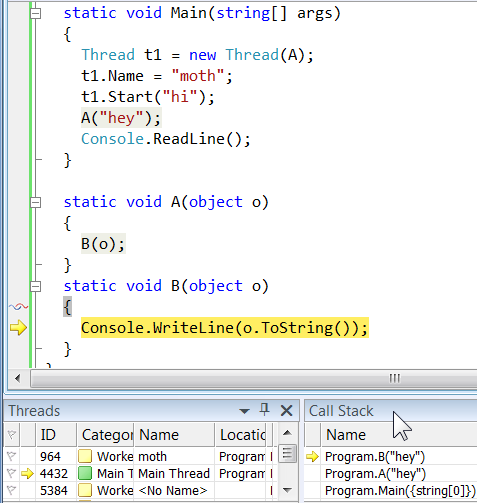 The Call Stack window indicates the top of stack (the latest stack frame) of the current thread with a yellow arrow icon (in the screenshot above, the “Program.B("hey")”). This is known as the active stack frame. When switching threads, obviously the active stack frame changes. When execution resumes (e.g. via F5), the execution continues from the active stack frame onwards (to be more specific, from the active stack frames of any/all of the threads). The active stack frame, by default, is also the current stack frame for that thread. Obviously, if you change the current stack frame, when execution resumes it will still resume from the active stack frame(s). So, setting the current stack frame is purely a temporary action for inspecting the relevant data to that frame, e.g. in the Locals window. 1. Yellow arrow: for the active stack frame of the current thread (in our example, of “Main Thread”). 2. 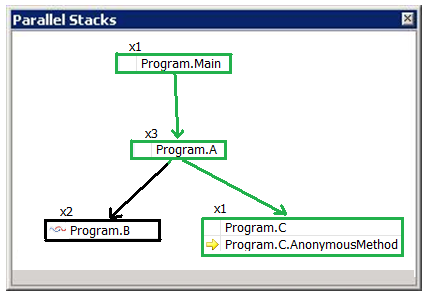 Green arrow icon: if we have set the current stack frame to be something other than the top of stack (in our example, “Program.A”). 3. Red and blue cloth threads icon: the active stack frames of all other non-current threads (in our example, “moth”). Quick Check: If you double click on the “moth” thread in the Threads window, what would the screenshot above look like in terms of icons in the code editor, threads window and call stack window? Picture it first and then check your answer by viewing this screenshot. Did you get it right? Developers that have not used VS2008 in multithreaded programs, tend to forget the usefulness of the red and blue cloth threads icon. If you are one of those devs, watch my video for a refresher. Let me ask another easy question: Why don’t we see this new icon anywhere else in the debugger toolwindows? The obvious answer to the question is that: no toolwindow shows active stack frames of non-current threads; hence the cloth threads icon does not appear anywhere. 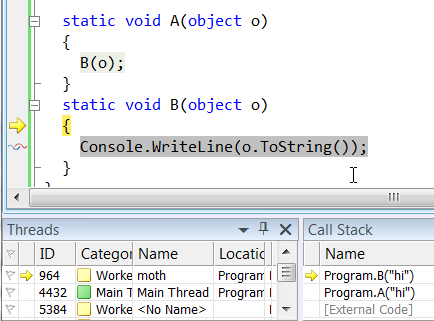 Whilst debugging code that uses multiple anonymous methods (or lambdas) from a single method combined with multiple Threads, an interesting issue surfaces with the stack frames that Visual Studio 2008 presents. Are both of those Threads with the same location string (Program.Main.AnonymousMethod) at the same place in the code editor? Look at the code editor and the answer is no. The icons with the blue and red “cloth threads” in the gutter of the editor show the two locations: one is at t2.Wait and the other at the Console.WriteLine (you can verify this by hovering over the icons to see the tooltip with Thread info). 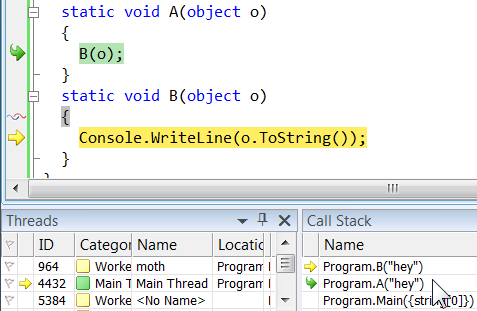 Bottom line: The Location column (and Stack Tip) of the Threads window (and the Call Stack window in fact) are not telling you the full truth. 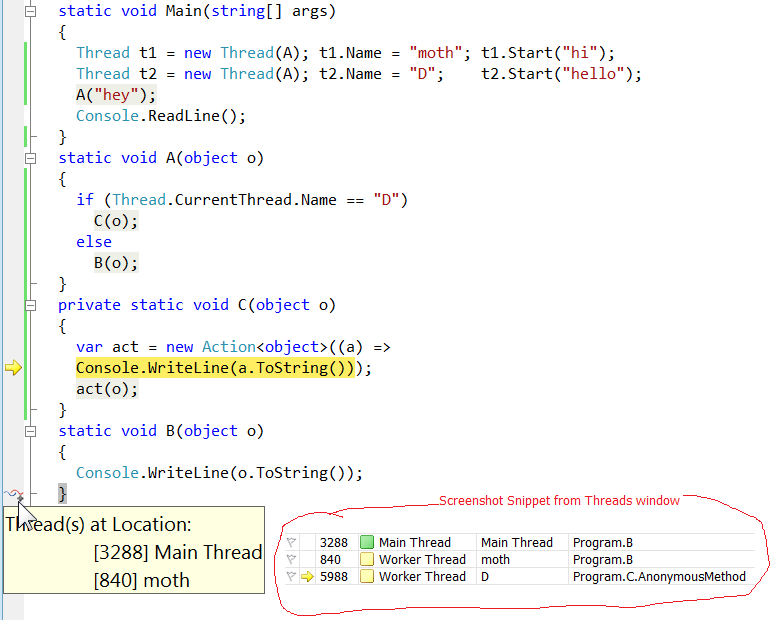 They are indicating that thread execution is in some anonymous method, but they are not distinguishing between different anonymous methods. It would be nice if they at least appended a number to the string: AnonymousMethod1 AnonymousMethod2, etc. Aside: The real method name of the anonymous method in IL code starts with a chevron and is generally funky and it wouldn't add value to be displayed here. All we need is the ability to distinguish between different anonymous methods in the debugger tool windows, hence my suggestion above about suffixing them with a number. Do you have a better suggestion? In a quiz I posted recently, I had some replies in the comments (which are incorrect btw) and more replies over emails that were correct (with a caveat). I am referring to question A (and I touched on the motivation for question B here). In short, the correct answer to (trick) question A is that the only thing guaranteed is breakpoint #5 will be hit last and BP #1 happens before #2 and #3. There is a race between BP #4 and #1 and then a similar race between BP #2 and #3, which means that we cannot tell the overall order. Now, I mentioned above that there was a caveat: In majority of replies they stressed that even though we cannot tell for sure, it is likely/probable that BP #4 would be hit before #1 due to overhead of setting up the child Task. Indeed if you run that exact code on your dual core machine, you’ll likely/probably find that that is the case. However, this is certainly not guaranteed or expected. ...and of course passing tm as the last argument to the Create methods. Try it! If you think that changing the thread priority was too artificial/contrived, consider that if it is a kernel event that wakes up the scheduler thread it could result in a priority boost, which has a similar risk of causing pre-emption. If there is one guarantee about what threads run when, it is that there is no guarantee - and any internal engine (CLR, Windows) has the right to change their implementation details anyway so don't rely on empirical findings. What are the interesting properties of Tasks at runtime? The second question (B) of the quiz I posted here was meant to make you think about the complications of adding a Task reference to the Watch window. I then went on to show how to use Tack.Current and make object id as a technique to help a bit. I continued by taking advantage of the DebuggerDisplayAttribute which essentially results in a productivity boost. The real question though is why during debugging would I want to watch a Task to start with? Well, my hope is that the Task object would get more public properties that I can use to determine things like e.g. its status. But the real need is to be able to create a holistic view of my system in terms of *all* the Tasks that my code creates explicitly or implicitly. That need is what I’ve been trying to approximate with the Watch window, but so far it has ended up being a very poor solution. So, my wish as a developer embracing the Task-based programming, is to have some way (e.g. a new VS debugger toolwindow?) of viewing all the Tasks in my system and being able to quickly determine which ones are not scheduled yet (let’s call them Initialized), which ones are Running and which ones have run a bit and now are Waiting on some resource before they can continue. If we imagine that we have this view, then I get greedy and I also want to be able to quickly see the call stack of each Task and also which thread it is executing on. My greed continues to the extent of wanting to easily view the parent-child relationship between Tasks. Have I missed any requirement? What information would you want to see in a dedicated Tasks window? Using the Make Object ID feature we were able to turn this screenshot into that screenshot. Building on the Task.Current approach, I wanted to avoid having to expand the variable and instead wanted to get a quick glimpse of the properties of interest with just one glance. 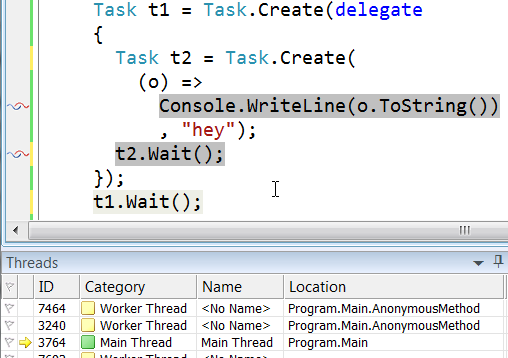 Then I remembered the DebuggerDisplayAttribute (part of the nice debugger visualizers wave introduced in VS2005).